Just 10 days to go before school starts here in Texas! 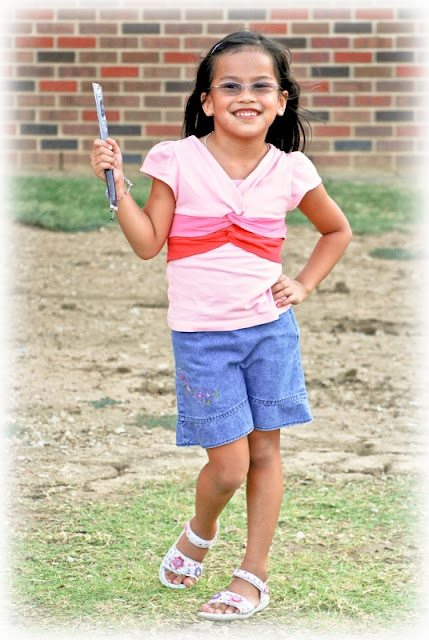 I'm so excited for Cherlin who'll be in Kindergarten this year! Quite sad because my baby and little helper won't be with me the whole day anymore. I'll really be missing her...but I'm so happy with the thought that my baby has grown into a smart little girl who seems so ready to face a new world. Yesterday was "Popsicle with the Principal" at Robertson Elementary (Clarise and Cherlin's school). 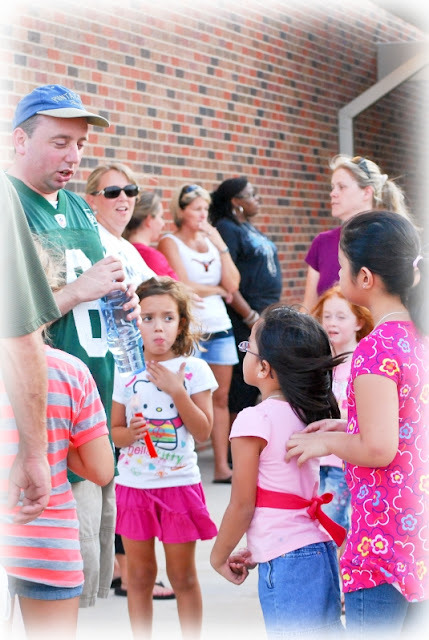 Cherlin was so eager to go, not just because of the popsicles but also to be able to shake hands with the principal. I was so proud of her when she confidently talked to the principal. The smile on her face showed how excited she was to be in school. 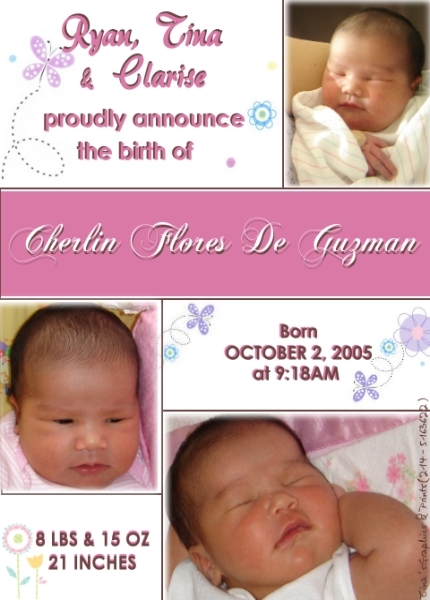 From that tiny helpless baby, she's this confident 5 year old now who's all set for a new level of exploration. I'm so proud of her but I can't help but feel sad. Actually, thinking about it put me in tears. This was exactly how I felt when Clarise started Kindergarten. But I know it will be more difficult for me now. It won't be easy to drop them both to school then come home into an empty house. I'll be missing the time Cherlin & I used to spend together while waiting for 3p.m. to pick up Clarise from school. I know this is just one of those feelings that fall under the job description of "being a mom", and yes, it will pass. I guess for now, I just have to focus on how lucky I am to see my bright, loving, healthy daughter turn into a Kindergartener, and learn to look on the bright side: Cherlin will learn a lot from school and meet new friends and I, on the other hand, will have more time for myself doing things I love like cooking and blogging (and shopping!). That would be good, right?! 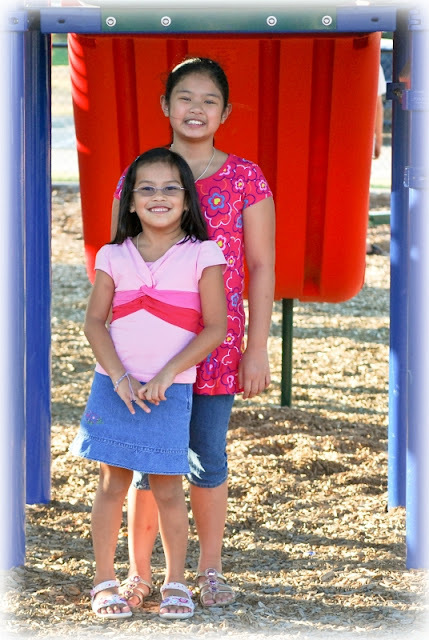 I am happy that Clarise and Cherlin seem so excited for the coming school year. At least, all I have to worry is me being sad for being left alone at home (LOL), and not them feeling uncomfortable in school or whatsoever. They even said that the thought of the bentos I will be preparing for them everyday is adding up to their excitement. That's really good to know! To see them enjoying bentos is the only reason why I got myself into bento-ing. Oh well, actually, they are my inspiration in everything I get myself into! 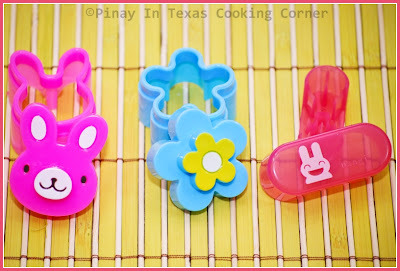 I used the bunny and flower shaped cutters for the sandwich, and the rabbit wiener cutter for the hotdogs. They're so cute, aren't they??? 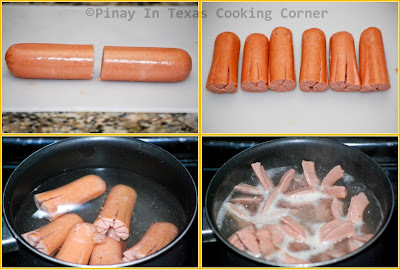 FYI, after shaping the hotdogs, I boiled them instead of frying. This results in nice evenly cooked hotdogs. 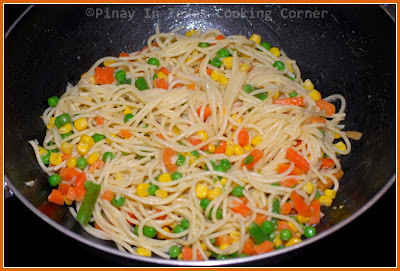 For the spaghetti, I just sauteed a Tablespoon of minced garlic and a cup of mixed vegetables in 4 Tbsp olive oil-flavored butter then mixed 3 cups of cooked pasta in it. For the octodogs, I used 3 regular sized beef franks. With the use of a sharp knife, I cut each of them into 2. Then I cut the 8 'legs' of the octopus, leaving about a third of each halved beef franks to form the head. Using a knife, I also made 2 small holes for eyes and a little slit for a smile, which became noticeable after cooking. I boiled them until the legs are all curled up, after which I drained them on paper towels before arranging in the bento box. 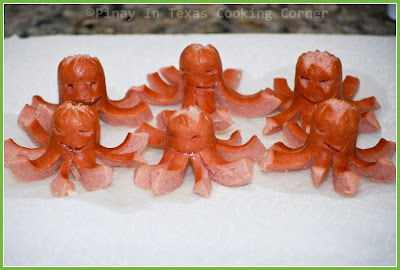 If you want a curlier effect, you can use 1 whole hot dog to make one octodog. 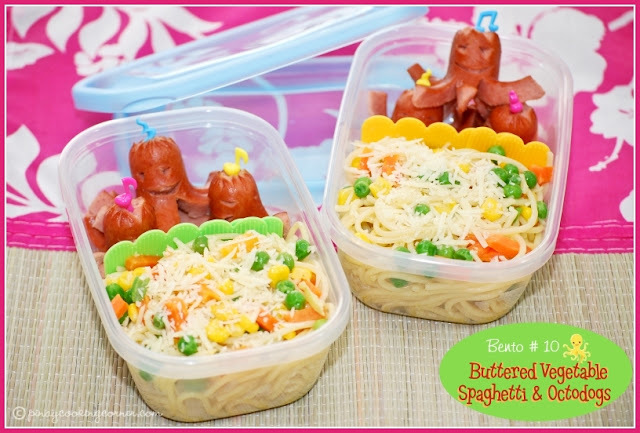 such cute bento inventions! I love it! Those look really appetizing! I'll try making those octodogs. 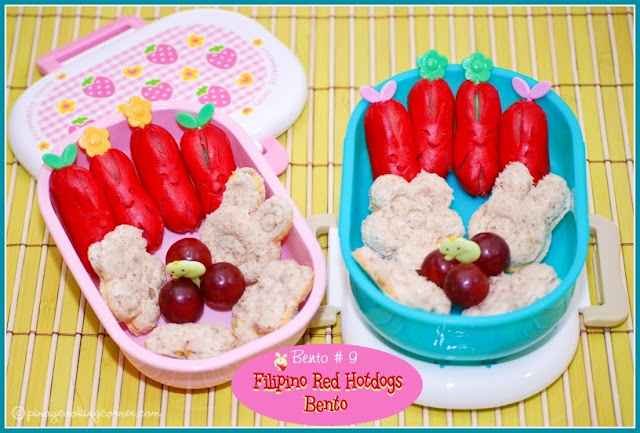 Too bad, we don't have red pinoy hotdogs over here, boo! Awww your kids are adorable, and I can see how happy and proud mom you are.. Your bento ideas are awesome..I am into it, and trying to find some small and colorful containers to put in my daughter's lunch box on Monday! Thanks for the inspiration! They grow up pretty fast Tina because my little one is already 27 but that age comes with different sets of issues. Its lovely for the effort of preparing their meal you have done. Now I wish I'm your kid! LOL. I came from bento culture but my mom didn't make these cute bentos for me... Now I don't even know if I can do that for my kids! Enzo is starting kinder on 24th too, and I'm VERY worried... lol. You're such a great mum, you know, taking all that trouble to make such nice things for your girls. They do grow up so quickly, don't they? Sigh ... soon they'll be young ladies and leaving the nest. Oh, sorry, we shall not look too far ahead ... enjoy the time now! I'm not looking forward to the first day of day care......I haven't even had my son yet and I'm already getting a little sad about it. I just bought the same bear and bunny molds to send to my niece. Now I'll send this link to her mom. Love the octodogs! Haha love the hot dogs. What fun lunch - must put a smile on their faces.